Dave Chappelle, In 2004, was at the top of his industry with his hit "Chappelle's Show" on Comedy Central. His massive popularity turned into a $50 million contract. Then he walked away, ending the show and never getting a massive payday. Tuesday night he talked to David Letterman about what his life has been like in the years since. 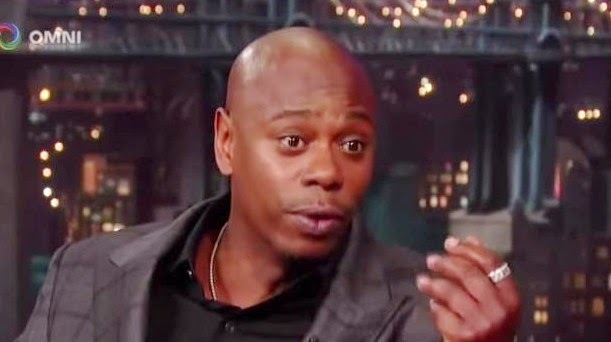 Chappelle told a stand-up audience in 2004 that the show was ruining his life and he didn't like having to work so much and take away from time doing stand-up comedy. Letterman asked him if he ever regrets saying no to a huge sum of money. "There's not too many people that don't think I'm crazy. So I look at it like this: I'm at a restaurant with my wife. It's a nice restaurant. We're eating dinner. I look across the room and I say, 'You see this guy over here across the room? He has $100 million. And we're eating the same entree. So, OK, fine, I don't have $50 million or whatever it was, but say I have $10 million in the bank. The difference in lifestyle is minuscule. The only difference between having $10 million and $50 million is an astounding $40 million ... Of course I would like to have that money." He went on to describe how his friends try to give him advice: "They'll be, like, 'Well, you know what Dave, at the end of the day, you still have your integrity.' And that's great, I'll go home and make the kids some integrity sandwiches. It makes no sense at all. "There's nothing anyone can say," he said. "It's just you do what you feel like you need to do." Chappelle was frank about the repercussions of his decision to walk away from the show and the millions of dollars that came with it. "I've felt a variety of ways in the last 10 years. You know, whenever there's something that I'd like to have that I could've afforded that I can't now afford, well then I'm upset about it." The one perk of leaving that pile of money on the table? Chappelle said he has plenty of free time to do what he wants to do.